At Ahonui and School streets, activists demonstrated for more safety in the heavy-traffic area. AARP organized the event. Traffic safety advocates renewed calls for caution around crosswalks yesterday at the site of Oahu's latest pedestrian accident. Dozens of AARP volunteers held signs at School and Ahonui streets, the site of a pedestrian accident Monday morning that critically injured a 79-year-old man. "We'd like to think that maybe we made a difference," said Jackie Boland, AARP-Hawaii's associate director of community outreach. "So it's very discouraging to us." 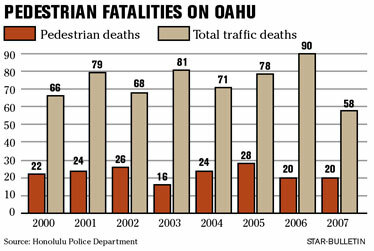 Two of the four traffic fatalities this year were pedestrians. Monday, the 79-year-old man apparently darted into a crosswalk at the Kalihi intersection and into the path of an Koko Head-bound vehicle. AARP is still critical of Gov. Linda Lingle's decision not to release money under a law passed last year. The Legislature overrode the governor's veto of a bill that granted $3 million from the state Highway Fund for pedestrian safety measures, but Lingle has argued the fund has been depleted and should not be used to subsidize county projects. 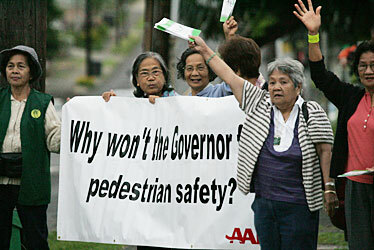 Myrna Acosta, a 69-year-old Pearl City resident, yesterday held up a sign that said, "Why won't the governor fund pedestrian safety?" Acosta crosses the School Street intersection every day to go to the Kokua Kalihi Valley center. "Even though you are in the middle of the street, the drivers still go," she said. About 25 volunteers at the intersection yesterday were part of AARP's rapid-response volunteers, going to intersections soon after an accident to draw attention to sidewalks and other safety issues to drivers and pedestrians. Boland said they will work more toward outreach efforts, rather than pushing for legislation this year. "We would hate to spend time on new legislation when we passed legislation last year that still needs to be implemented," Boland said. "So some of our strategies include expanding our rapid-response groups."